Architectural grade wood fire doors control the spread of fire and smoke for up to 1-1/2 hours (90 Minutes). 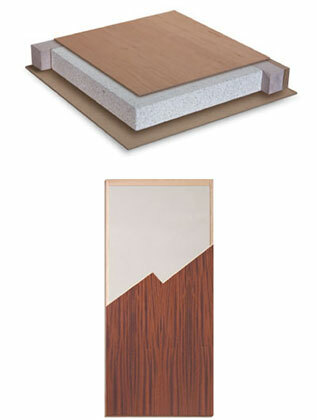 Fire-Rated wood doors are available in a variety of veneers, styles and sizes. Fire doors often are used on openings leading from corridors to offices, closets, storage rooms, stairwells, mechanical rooms or any other opening that penetrates a fire barrier wall. *(Mineral Core) includes double bevel, hinge and single bore lock preps. Call 1-844-TRUDOOR for a quote or use our Quote Builder (Be sure to add fire-rating requirements in the notes section, as doors are quoted non-rated unless specified). Fire doors are required to be self closing and positive latching. Door frame and hardware must also carry the appropriate fire label.